While the iPhone 5c has been up for pre-order since last Friday, inventory for the iPhone 5s is expected to move quickly. Anyone looking to grab a unit is best served arriving early, waiting in any potential line and hoping for the best. Just to recap: T-Mobile will launch the iPhone 5c and iPhone 5s in both 16GB, 32GB and 64GB flavors this Friday. The iPhone 5c will cost $0 down and 24 monthly payments of $22 per month for a total of $528 over two years. The iPhone 5s will arrive at $99 down and 24 monthly payments of $22.91 per month for a total cost of $648.84 for the 16GB variant. But will stores have stock of the 64GB 5s model? If they do, what kind of stock can we expect, very low yields? omg that is the question i have been asking for the longest time… can someone please answer this question! Might be useful for the ariticle to make that clear on what retail locations are going to stock vs. online. Agreed. Most people get the 16GB in my experience though with cloud storage being as good as it is nowadays. Either way, hope you get yours! yeah, I’m an old school “get as much storage as possible” guy, so I won’t be purchasing through T-Mobile, looks like. If only I had a bit of patience ;) But ordering an HTC One was a huge pain… not eager to repeat that one. Guess I’m ordering at 3:01! Yeah I’ll have to order online then too. I need at least 32GB. Might just order it through Apple instead since I’m paying full price and it will be unlocked out of the box. Can you order the phone online from t-mobile on the 20th? Will stores have stock of the 32GB 5C? My wife wants one of those. Deciding if we want to order online, or just pick one up at the store. Order online. I want a 32GB one as well and was told by cs to order online to avoid disappointment as most stores wont carry 32 or 64. If you order from Apple.com it will be delivered to your house ON the 20th. Saves time and the hassle of waiting for TMo to ship it. If I purchase the iPhone 5S for retail, will it be unlocked like the ones sold in Apple retail stores? Based on the last launch, no. You’ll have to follow standard unlock procedures. I just called multiple local T-Mobile stores and have found out that they will not carry any stock of the iPhone 5s on launch day (Sep 20). They will instead place direct to customer orders and the phone will be sent to your house no later then Tuesday. I called T-Mobile corporate and they verified that is correct. Only select stores will carry stock at first and then more will have it later. So, if you are not near one of the “select” stores then you have no choice but to order it. You sure about that? That would be a massive retail failure on the part of T-Mobile if the majority of their stores don’t have any phones in stock for the biggest retail launch of the year for cellular industry. I wouldn’t put it past T-Mobile. I love me some TMO, but they historically have taken 1 step forward, followed by 2 steps back. This is something they’d do. For years we’ve waited to get the iPhone and on TMO’s first offering of it on release day, it’s only available in “select” stores? Makes no damn sense. Sometimes it feels like they’re afraid of success b/c they seem to not capitalize on key opportunities. Then again, I’m just an armchair CEO and I have no clue if this info is valid (although I don’t doubt it). Guess we’ll see. I’m sure some internal document will leak about this if it indeed true. I just called the 2 local stores I go to the most and they both confirmed that they’ll be selling 16 GB models in-store on Friday. One guy told me they’ll open at 9, while the other told me 8. I’ll await further confirmation closer to Friday before I decide what I’m going to do. I’m 100% positive that this is true. This is not the first time T-Mobile has launched a phone, and only had select stores carry the phone at launch. I worked there 8 years so I can tell you with confidence CALL before you go to the store so you can confirm stock. This is factual and the very same thing they did with the HTC One, Galaxy S 4, Galaxy S III etc etc. Select stores simply means their high volume locations get first dibs. It’s not just T-Mobile. It’s all carriers. So will they get to my house Tuesday or be sent out Tuesday? If I remember correctly didn’t they usually only keep the 16gb stocked of the 5? If you wanted a larger capacity they had to send it to your home. I think I’m just going to order online. Seems like it’ll be less of a hassle. This is unfortunately true. There are many stores that will not have either the 5s or 5c on the launch day. The stores that will carry both devices on launch day will also have very limited quantities for the initial launch weekend. This is not because of the efforts of T-mobile but due to apple wanting to create a high demand for their products. 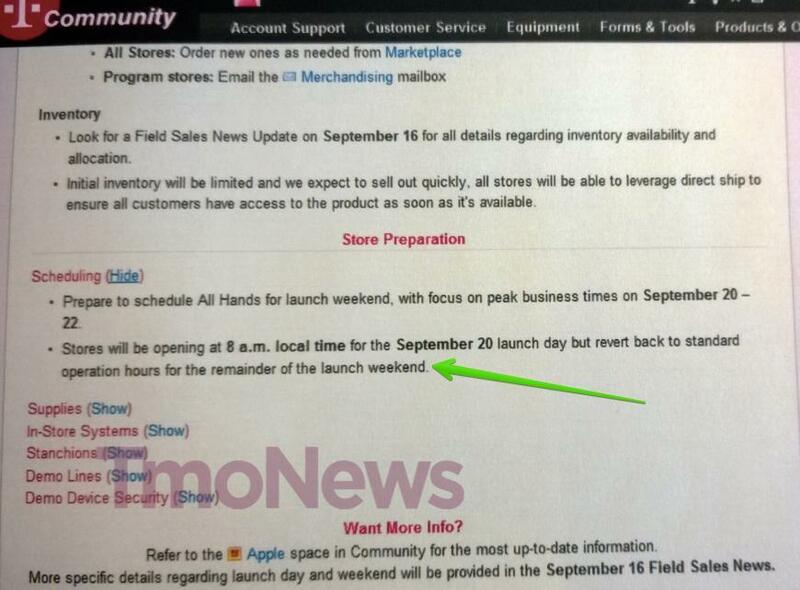 Most retail stores for T-mobile as well as Apple stores plan on being sold out of their inventory by 12 noon. P.S. dont plan on gettting the gold or silver 5s in stores. can i order from apple and pick it up when they open or pick it up later that day? I don’t believe Apple has announced an in-store pickup program for the iPhone yet. If you pre-order the 5C on Apple it says it will deliver on 9/20 for some models, others have slipping shipping dates. I’m assuming you can order the 5S first-thing Friday but won’t receive it until early the next week. Is there any difference between purchasing an unlocked 5s from Apple vs. purchasing a 5s from a T-mobile retail store…..besides the one from the Apple being unlocked as soon as I receive it? Advantages…disadvantages? The unlocked phone from Apple means you can walk into T-Mobile and sign up or switch phones while remaining on a month-to-month plan. If you purchase the phone from T-Mobile at the $99 price, you are agreeing to pay off the phone over a couple of years. You’re still not on contract, but if you cancel your plan you must pay the balance due. (Makes sense and there’s no ETF or interest due.) T-Mobile can unlock your phone using its standard procedure, of course, should you wish to use the phone internationally or if you plan on switching carriers. Maybe a biased board on which to ask, but I thought I’d try… I’m an out-of-contract AT&T customer looking to pick up a new iPhone 5S next weekend. I’m seriously considering a switch to TMO given their recent awesomeness. I spend most of my time in eastern MA and upstate NY, and travel extensively internationally for work where I mooch wi-fi for my personal phone. Cost-wise it’s a wash, given my AT&T loyalty discounts, grandfathered unlimited plan, etc. Thoughts on switching? I’m all ears and could use some advice! My two cents: Check the T-Mobile coverage maps. They’re a great carrier if you have reliable service in your particular area(s). Having spent some time in the Boston area, coverage was pretty great there. As for upstate NY, I had fine service in Albany and Buffalo, but virtually no coverage in the more remote parts of the Finger Lakes region if I recall correctly. In general, T-Mobile is pretty solid in more urban areas. I now work in a pretty remote part of Virginia where all I have is a couple of bars of EDGE. Ugh. I’m a sad panda. Thankfully, I have pretty solid 4G coverage at home. If you are out of contract with atat you can get your phone unlocked. & use pre-paid for a few days see how it works & then decide if you want to stick with it. Honestly I kind of regret switching to T Mobile from AT&T. You save a LOT of money, but the coverage is bad, even where you are supposed to have good coverage. I can drive down a one street and go from 4G to E to No service and back to 4G. What time will we be able to order online? Ordering my 5S on line as soon as allowed. Not sure about color. PS – also buying the Note 3 when available to buy on line. I’m just crazy about these new phones and have to own them. dont be tools! Just fing a corporate store and they will have it in stock. Usually two stores are located per large city. If you live in the boonies….then, um, yeah! Reports are now saying initial iPhone 5S stock will be severely constrained at launch. Meaning some stores will probably only have a few or even none in stock. I have got an Gold Plated Iphone 5 from igoldworld before coming on Germany. I was told by a T-Mobile rep that NONE of the stores will be receiving ANY direct inventory and that if you come into the store, that they will order the phone for you.